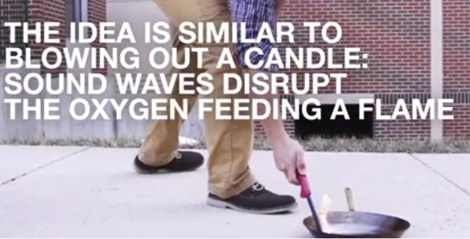 Two George Mason University students created a device that fights flames with sound waves. We’ve always dreamt of putting out kitchen fires by playing “B.M.F.” in the general direction of the stove—but we didn’t actually think it’d work. I see this device being applied to a lot of things. First off, in the kitchen, I think it could be on top of a stovetop. But eventually, I’d like to see this applied to swarm robotics where it would be attached to a drone and that would be applied to forest fires or even building fires. The video shows one of the inventors, Seth Robertson, aiming the extinguisher at a small fire lit in a kitchen skillet. As the device emits a low hum, the flames waver briefly and almost immediately vanish—no water, chemicals, or foam needed. Good thing cooking and heavy bass go so well together.